Preheat the oven to 400°F. Arrange beets in a small roasting pan and add 2 tablespoons water. Cover securely with foil and roast until beets are tender when pierced with the tip of a knife, 35 to 40 minutes, adding a tablespoon or two more water if the pan dries up. Cool beets, then rub with a paper towel to remove skins. Cut beets in half lengthwise. Spread labneh on half of a platter or on half of individual serving plates. 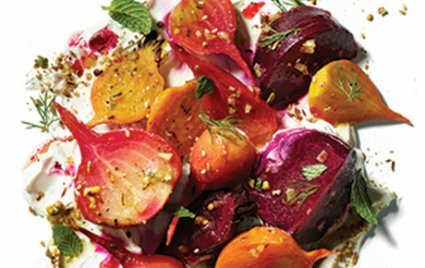 Top with beets and sprinkle with mint, dill and dukkah. Drizzle with oil and sprinkle with flaky salt and serve. Per Serving: 170 calories 10g total fat, 5g saturated fat, 10mg cholesterol, 400mg sodium, 13gcarbohydrates, (3 g dietary fiber, 9g sugar), 6g protein.